AJ Tree Service offers a number of personalized landscaping services that can help you improve your property. We are able to work on both residential and commercial properties without any problem. We can remove any trees on your property. This is especially useful for when you have a tree in a dangerous location, in the way of something or you need to take down a rotten tree before it falls. Keep your trees looking neat and tidy through our convenient tree trimming and pruning services. 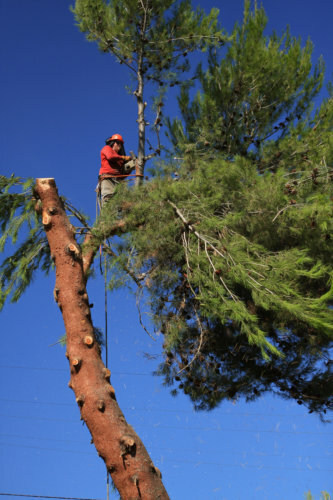 Through our tree topping services, we can remove the tops of the trees that are located on your property. If you would like to add trees to your property, we can plant them where you want them. It can be difficult to remove a stump, so just leave it to us. If a tree is in a dangerous position of falling towards a structure, we can cable it and brace it for you. We offer quick and responsive emergency tree services that you can enjoy immediately. We can help provide you with all of the firewood you could ever need. Transform your yard into a work of art with our extensive landscaping services. Do you need a lot cleared? We offer convenient and hassle-free lot clearing services for you. Keep your shrubs and hedges clean with our trimming services. Keep your flowers looking beautiful at all times through our flowerbed maintenance services. We can put in all of the sod and mulch you could ever need at an affordable price. Cleaning up the leaves during fall can be a huge hassle, so allow us to handle it for you with our convenient spring and fall clean-up services. Cleaning the gutters can be both time consuming and dangerous, so leave it to us. If you would like to find out more about our services in tree removal and landscaping in Tulsa Oklahoma, please do not hesitate to give us a call at 918-232-4853.